What is likely to be the final Red Bull Indianapolis Grand Prix today produced two memorable shootouts. Up front, defending Honda world champion Marc Marquez dogged Yamaha stud Jorge Lorenzo for 24 laps before stealing his lunch money at Turn 1 of Lap 25 and holding the Mallorcan off for the final three laps. The undercard featured Yamaha icon Valentino Rossi and Repsol #2 Dani Pedrosa in an equally riveting daylong battle for third place. Rossi prevailed after half a dozen lead changes over the last 10 laps, keeping his string of 2015 podia intact and his lead over teammate Lorenzo at nine points. At the start, Lorenzo rocketed out of the three hole to lead the pack into Turn 1, trailed by Marquez, Pedrosa, Ducati #1 Andrea Iannone, Tech 3 Yamaha’s Bradley Smith and Rossi, whose loss today was once again assured in qualifying on Saturday. By the end of Lap 5 Rossi had taken over fourth place, and the lines were drawn. At that point, Rossi trailed Pedrosa by 1.6 seconds, but you got the impression that the Italian marvel wasn’t going to go down without a fight. By Lap 14, Rossi trailed Pedrosa by a mere three tenths. While Lorenzo continued to lead Marquez, who appeared to be biding his time letting Jorge do the “donkey work,” I made a quick note: Y H H Y –> H Y Y H. This was my shorthand prediction that the Yamahas would move from positions one and four to finish second and third. Midway through the race, my suspicion that Marquez would eventually take down Lorenzo while Rossi outraced Pedrosa was, in the end, rewarded. Prior to the race I had envisioned two Hondas and one Yamaha on the podium; that prediction turned out wrong by 18/100ths of a second, Rossi’s margin over Pedrosa at the line. At this point in 2015 there can be no argument that Marc Marquez has returned to his otherworldly form of the past two seasons. For the first 25 laps today he was maintaining strict control of his RC213V, not throwing the front into the turns and waiting for the rear to show up. Once he made his move on Lorenzo he engaged his “reckless abandon” setting and turned the dogs loose. Lorenzo would get close several times over the last three laps, but he wasn’t going to get past young Marquez late in the day. Pedrosa, who had improved steadily between Friday morning and Sunday, qualifying second, appeared ready, willing and able to podium today. There was a time when Pedrosa would have taken on the two leaders once his fuel load dropped, but that day appears to have passed. Rossi, for his part, will either figure out how to deal with the 15 minute qualifying sessions or see perhaps his last best chance for a tenth world championship vanish before his eyes. He may be the fastest raceday rider on the grid, but his habit of consistently digging himself a hole on Saturday and trying to climb out on Sunday will eventually burn him. Lorenzo, much more interested in Rossi than Marquez, adjusted his strategy for qualifying, opting for three runs rather than two, simply in an effort to gain a front row start today. Had qualifying been limited to 13.5 minutes rather than 15, Lorenzo would have started at the back of the second row, his race strategy blown. This year, more than any year in recent memory, races are being won and lost on Saturday. Ducati #1 Andrea Iannone qualified seventh and finished fifth today on his 26th birthday while teammate Andrea Dovizioso went seriously walkabout at Turn 2 of Lap 1, re-entered the race in last place, i.e., behind Toni Elias, and pedaled his posterior off for a distasteful ninth place finish. Dovizioso, once the model of consistency and control, had amassed a total of four (4) points in the previous four rounds before hitting a seven point jackpot today. Anyway, Espargaro held off LCR Honda’s Cal Crutchlow today for seventh place while rising Octo Pramac star Danilo Petrucci, who had received a major tow on Saturday into a second row start, completed the top ten riders. The two Suzuki guys had utterly forgettable weekends in Hoosierville. Rookie Maverick Vinales qualified ninth and finished 11th, while the elder Espargaro, Aleix, dawdled through Q2 to start 12th and could only manage a 14th place finish. While it’s safe to say the Indianapolis Motor Speedway is not terribly friendly to any of the manufacturers, it seems distinctly unfriendly to the Suzukis. Team Ecstar will probably be thrilled to see Indianapolis fall off the calendar next year. Just for the record, lest I be accused of ignoring the only American on the grid, Nicky Hayden had a criminally bad hair day today on his way to finishing 16th. Kind of a weak semi-mullet with a painfully lame mini-ponytail on top. The kind of haircut that would be much better suited to World Super Bike. Movistar Yamaha maintains control of the 2015 championship, with Rossi on top of Lorenzo by nine points and Lorenzo leading Marquez by 47. Even though Marquez has gathered 70 points over the last three rounds, Rossi has earned 57 and Lorenzo 49. 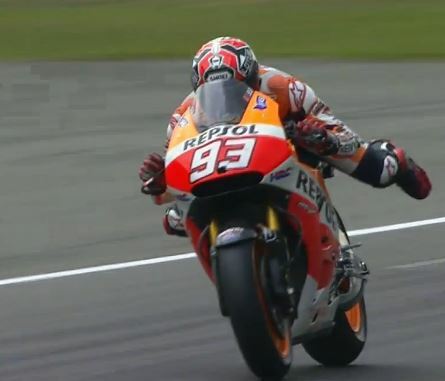 At this rate, Marquez will not catch Rossi until Round 24, a virtual impossibility in an 18 round season. Iannone holds a solid grip on fourth place, 32 points ahead of Smith and 35 points ahead of former Ducati #1 Dovizioso. Despite having started three fewer races due to injury, Pedrosa now leads wannabe Alien Cal Crutchlow by six points, with Pol Espargaro a single point farther back. 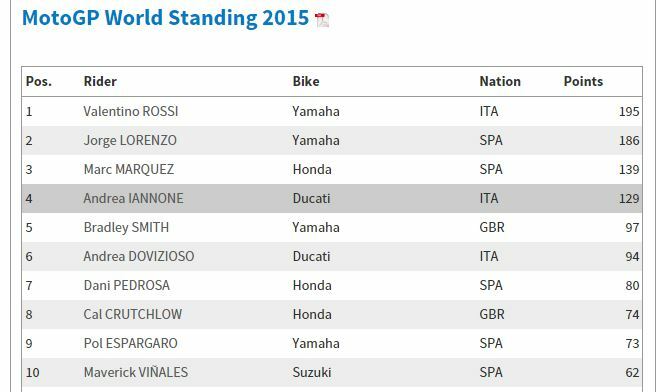 Vinales rounds out the top ten with 62 points. It’s a short week until Round 11 at Brno, The Circuit That Desperately Needs a Vowel. Forward Racing is slated to perform its swan song in the Czech Republic, with the pitiable Loris Baz riding their last open class Yamaha until and unless he breaks it prior to the race. Karel Abraham figures to return to his Cardion AB Honda, since all his aunts and uncles will be there cheering for him to earn a point or two. Brno is one of those long flowing circuits that tend to favor the Yamahas, so Marc Marquez will need to bring his A game if he intends to continue to cut the gap between himself and the Bruise Brothers. This doesn’t appear to present much of a problem, in that he once again looks unbeatable. But there don’t appear to be enough battles left to allow him to win The War of 2015. Aliens expecting close encounter at The Brickyard. By Bruce Allen. Exclusive to Motorcycle.com. MotoGP starts the back nine of the 2015 season this week in Indianapolis with all four Aliens looking fast and frisky. 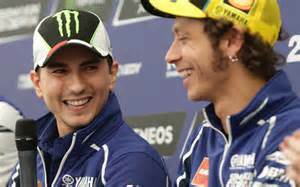 At the top of the heap, a mere 13 points separate factory Yamaha grandees Valentino Rossi and Jorge Lorenzo. Factory Ducati interloper Andrea Iannone, in third, sits squarely in the crosshairs of defending world champion Marc Marquez, who finally has his Repsol Honda figured out. Hard luck Dani Pedrosa on the #2 Repsol bike, health fully restored, loves Indianapolis. Expect an all-Alien battle for the podium in the Hoosier heartland heat on Sunday. Having been given last rites after his third DNF of the year in Catalunya, Marquez has since returned to his frightening form of the past two years with a podium in Assen and a win at The Sachsenring. But 52 points separate him from second place; conventional wisdom suggests it took too long for him to find the proper frame and settings for an historic second half rally. While he’s finally doing well—really well—both Rossi and Lorenzo are at the top of their respective games, giving meaning to the term “veteran.” Moreover, while Indianapolis remains a Honda-friendly venue, the next four rounds—Brno, Silverstone, Misano and Aragon—are all painted Yamaha blue. To put himself back in title contention for the home stretch, Marquez must be essentially flawless. And both Rossi and Lorenzo need to experience some serious adversity. Some might say the Bruise Brothers are overdue for a fall or two, while others will insist they can easily stiff-arm the young Catalan wonder over the next nine rounds. The wildcard in all of this is the intra-team competition at Yamaha, with both riders determined to do whatever it takes to win the title. For these two, suffering greatly from the sin of pride—machismo–second place is little different from last. Shades of 2009. 2012 saw Dani Pedrosa win going away, followed by Lorenzo, Andrea Dovizioso on the Tech 3 Yamaha, and Casey Stoner, who rode essentially on one leg, having broken an ankle in qualifying on Saturday. Stoner’s first loss in his last four American outings would be followed by three DNSes, putting an end to any hopes he might have harbored about a repeat world title. Nicky Hayden who, along with Stoner and Spies, crashed in qualifying, broke his wrist and had to sit out his home race. 2012 was the high water mark of Ben Spies’ brief MotoGP career, as he started on the front row but blew his engine while chasing Pedrosa in 2nd place. 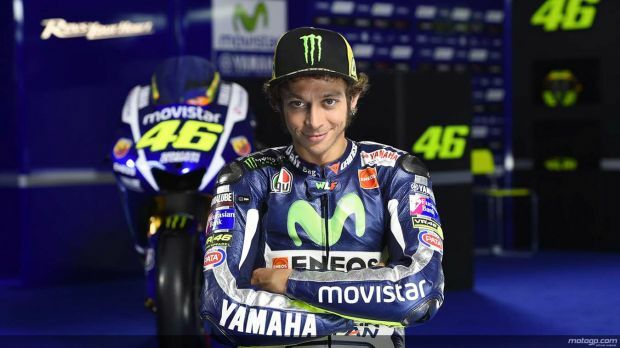 He would move down to Ducati for a miserable 2013 season before exiting MotoGP for good at the end of the year. Marc Marquez’ win at Indy in 2013 gave him a hat trick of hat tricks for his first remarkable season in MotoGP. It was his third consecutive win at Indianapolis, the other two having come in Moto2. It marked his third consecutive win in 2013 following superlative outings at The Sachsenring and Laguna Seca. And it was his third consecutive win in the US, following wins in Austin and Monterey. 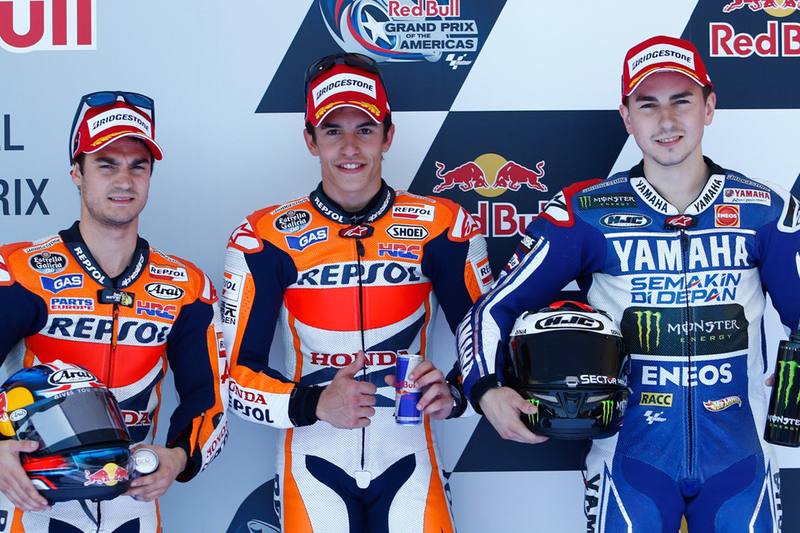 Pedrosa took second place that day, Lorenzo third, and Rossi a distant fourth. Having topped the time sheets in every practice session, the defending world champion’s win on Sunday came as no surprise. 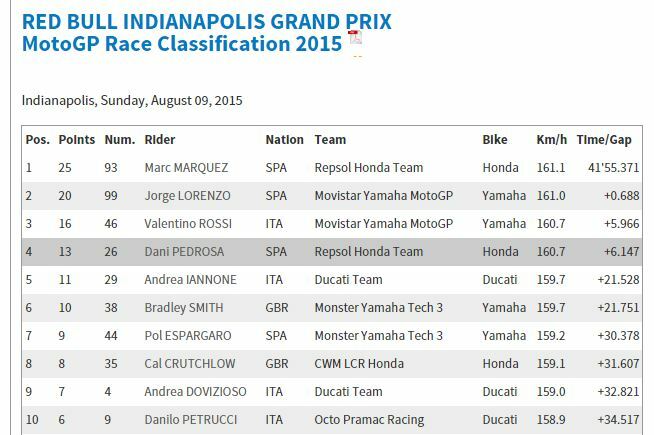 Last year Marquez made it four in a row at Indianapolis, beating Lorenzo by 1.8 seconds and Rossi by 6.5. He was running in third place when the two Italian leaders, Rossi and Dovizioso, had their own close encounter on Lap 6, forcing both to run wide and opening the door for Marquez. Modifications to the layout and to the racing surface during the offseason made Indianapolis more Yamaha-friendly than it had previously been, but the Catalan’s win last year put him 10 for 10 in 2014, his cushion by then so large that he was able to coast to the title despite a relatively ordinary second half season. Lorenzo, as we know, mounted a furious second half charge which fell short but which helped propel him to a strong start this year. Events of the past three weeks have revealed just how tenuous many of the sponsor relationships are in this game. In a boutique sport like MotoGP (as opposed to a mass market industry like the NFL), owners often need to seek out sponsors who, sharing William F. Buckley’s famous view on yachtsmen, “enjoy standing under a cold shower tearing up $100 bills.” Several dominoes have fallen recently, the most unsavory being the jailing of Forward Racing boss Giovanni Cuzari on charges of money laundering, tax evasion and bribery, with an investigation of LCR Racing’s lead sponsor, CWM (Capital World Markets) boss Anthony Constantinou on charges of sexual harassment running a close second. All of the above has put the fortunes of both Forward Racing and LCR in jeopardy for 2016. 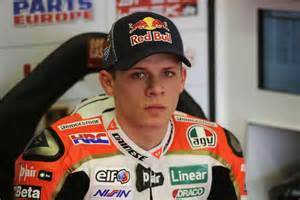 And, while Bradl has kept his iron in the fire, moving from the Forward Yamaha to the Gresini Aprilia cannot be viewed as a career advancement. If such action had occurred on track, it would have been referred to as “a gigantic moment.” Meanwhile, it appears likely that LCR will be unable to field a two bike team next year, with Jack Miller’s prospects, bolstered by HRC, for continuing with the team apparently stronger than Cal Crutchlow’s, as the Brit has seriously underachieved, while running his mouth and burning yet more bridges, on his Honda RC213V this season. 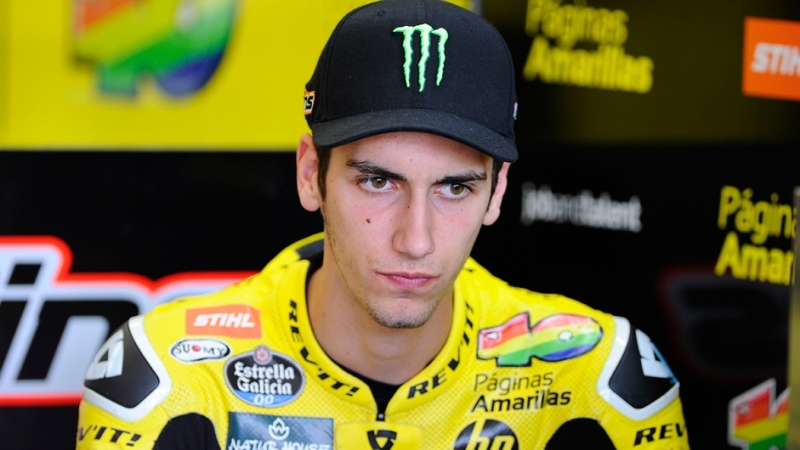 Poor Cal may have to go crawling on his belly back to Tech 3 which, in my opinion anyway, would be foolish to part with Pol Espargaro in favor of the consistently disgruntled and older Crutchlow. A loyal reader has pointed out how 2016 looks to be a lousy year to be a rookie in MotoGP, what with the adopted changes in electronics and tires combining to throw a one-two punch at everyone and sure to make life especially difficult for newbies. Add to this the fact that the riders in the upper tranches are already contracted for 2016. The emerging sponsorship difficulties at the back of the pack, Nicky Hayden’s long-expected move to World Super Bike notwithstanding, and rumors swirling around Johann Zarco, Tito Rabat and Sam Lowes suggest there may be more bums than seats available next year. It is easy to imagine the grid shrinking for a year before KTM joins the fray in 2017. With conditions at the IMS expected to be hot and humid, look for the Hondas to enjoy their usual advantage in such conditions. 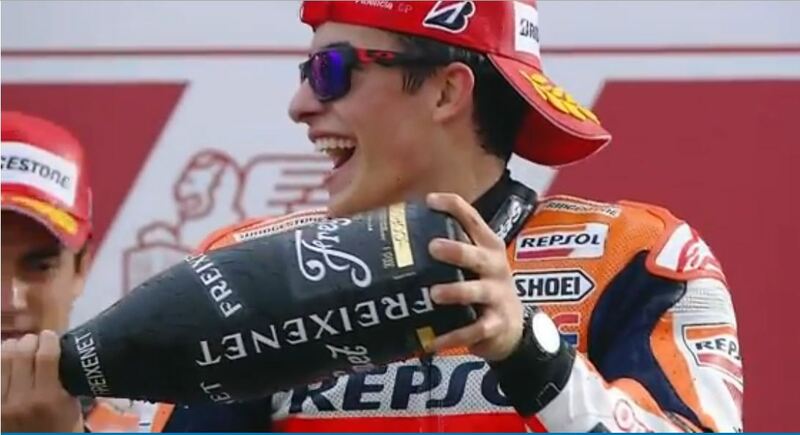 It wouldn’t surprise me at all to see Marquez at the top of the podium and Pedrosa on a lower step, with either Rossi or Lorenzo making up the final rostrum spot. We’ll have race results and analysis right here on Sunday afternoon.